MARSHALL ALLEN PRESENTS SUN RA AND HIS ARKESTRA-IN THE ORBIT OF RA. Enigmatic and innovative describes the man whose been referred Mr. Mystery, Sun Ra. He was, without doubt, one of the most important figures in jazz music. Constantly, Sun Ra’s pushed musical boundaries. Sun Ra was never content to stand still musically. Similarly, he was always striving to reinvent his music. The original version of a song was merely the starting point. What it became, was anyone’s guess? Sun Ra, forever determined to innovate, and reinvent a track, took his music in the most unexpected direction. He combined Egyptian history and space-age cosmic philosophy with freeform jazz. This innovative fusion transformed the career of the man born Herman Poole Blount. He became a giant of jazz. However, this didn’t come easily. Sun Ra was a perfectionist and relentless taskmaster. He brought together some of most talented, inventive and adventurous musicians he could find. They became his Arkestra. After that, Sun Ra’s started transforming them into one of jazz music’s legendary orchestras. This took time, patience and dedication. Having honed their sound, Sun Ra took his band on the road. That’s where they developed and refined their unique chemistry. Eventually, Sun Ra and His Arkestra made their recording debut. Their debut album was 1956s Jazz by Sun Ra. This was the first of over a hundred studio and live albums Sun Ra and His Arkestra recorded. With so many albums in his back-catalogue, choosing twenty tracks for a compilation to celebrate the 100th anniversary of Sun Ra’s birth can’t have been easy. However, Strut Records managed to do so. They had an advantage though. Art Yard, one of Sun Ra’s most loyal lieutenants in the Arkestra helped compile Marshall Allen Presents Sun Ra and His Arkestra-In The Orbit Of Sun Ra. It’s a twenty-track, double album, that be released on Strut Records on 22nd September 2014. Before I pick the highlights of Marshall Allen Presents Sun Ra and His Arkestra-In The Orbit Of Herman’s, I’ll tell you about Sun Ra’s career. Before dawning the role of Sun Ra, he was born Herman Poole Blount, on 22nd May 1914, in Birmingham, Alabama. Very little is known about Herman’s’s early life. So much so, that for years, nobody knew what age Herman was. What we do know, that growing up, Herman immersed himself in music. He learnt to play the piao at an early age. Soon, he was a talented pianist. By the age of eleven, Herman was to able read and write music. It wasn’t just playing music Herman enjoyed. When musicians swung through Birmingham, Herman was there to see everyone from Duke Ellington to Fats Waller. This inspired Herman to become a professional musician. By his mid teens, Herman was a high school student. However, music was Herman’s’s first love. Music teacher John T. “Fess” Whatley realised this. He helped Herman’s’s nascent musical career. John was a strict disciplinarian. This rubbed off on Herman. Later, he would be relentless taskmaster when he formed his Arkestra. This worked. When the Arkestra were in full flow, they were peerless. However, that was way in the future. Before that, Herman’s’s career was just unfolding. In his spare time, Herman was playing semi-professionally. He played in various jazz and R&B groups and as a solo artist. Before long, Herman was a popular draw. This was helped by his ability to memorise popular songs and play them on demand. Strangely, away from music, the young Herman was very different. He’s remembered as studious, kindly and something of a loner. Herman’s was a deeply religious young man. That’s despite not being a member of a particular church. One organisation that Herman joined was the Black Masonic Lodge. This allowed Herman’s access to one of the largest collection of books in Birmingham. For a studious young man like Herman’s, this allowed him to broaden his knowledge of various subjects. Whether this included the poetry and Egyptology that would later influence Herman’s’s musical career, isn’t known. The next step in Herman’s’s musical career came in 1934. Ethel Harper, his biology teacher from the high school, had a band. Herman was asked to join. After joining the musician’s union, Herman toured the Southeast and Midwest. Then when Ethel left the band to join The Ginger Snaps, Herman took over the band. With Ethel gone, the band was renamed The Sonny Blount Orchestra. It headed out on the road and toured for several months. Sadly, The Sonny Blount Orchestra wasn’t making money. Eventually, the band split up. However, other musicians and music lovers were impressed by The Sonny Blount Orchestra. This resulted in Herman being always in demand as a session musician. He was highly regarded within the Birmingham musical community. So much so, that Herman was awarded a music scholarship to Alabama Agricultural and Mechanical University in 1937. Sadly, he dropped out after a year when his life changed forever. It was in 1937, that Herman experienced a life-changing experience. It’s a story he tells many times throughout his life. He describes a bright light appearing around him and his body changing. “I could see through myself. And I went up… I wasn’t in human form….I landed on a planet that I identified as Saturn. They teleported me. I was down on a stage with them. They wanted to talk with me…They told me to stop attending college because there was going to be great trouble in school … the world was going into complete chaos … I would speak through music, and the world would listen. That’s what they told me.” For a deeply religious young man, this was disturbing and exciting. It certainly inspired Herman. After his “trip to Saturn,” Herman dedicated himself to music. He devoted himself to music. So much so, that he hardly found time to sleep. All Herman did was practice and write songs. The first floor of his home was transformed into a musical workshop. That’s where he rehearsed with the musicians in his band. Away from music, Herman’s took to discussing religious matters. Mostly, though, music dominated Herman’s’s life. So it’s no surprise that Herman decided to form a new band. He decided to reform The Sonny Blount Orchestra. It showcased the new Herman’s. He was a dedicated bandleader, who like his mentor John T. “Fess” Whatley, was a strict disciplinarian. Herman’s was determined his band would be the best in Birmingham. Seamlessly, The Sonny Blount Orchestra were able to change direction, and play an eclectic selection of music. Before long, The Sonny Blount Orchestra were one of most in-demand bands in Birmingham. Things were looking good for Herman. Then in 1942, The Sonny Blount Orchestra were no more. Herman was drafted. On receiving his draft papers, Herman declared himself a conscientious objector. He cited not just religious objections to war and killing, but that he had to financially support his great-aunt Ida. Then there was the chronic hernia that blighted Herman’s’s life. The draft board rejected his appeal. Things got worse. His family were embarrassed by Herman’s’s refusal to fight. Some turned their back on him. Eventually, Herman was offered the opportunity to do Civilian Public Service. However, he failed to appear at the camp in Pennsylvania on December 8th 1942. This resulted in Herman being arrested. When he was brought before the court, Herman debated points of law and the meaning of excerpts from the Bible. When this didn’t convince the judge Herman said he’d would use a military weapon to kill the first high-ranking military officer possible. This resulted in Herman being jailed. For Herman, this lead to one of the most disturbing periods in his life. So bad was Herman’s experience in military prison that he had to write to the US Marshals Service in January 1943. By then, Herman felt he was on the verge of a nervous breakdown. He was suffering from stress and suicidal. There was also the constant fear that he’d be attacked. Luckily, the US Marshals Service looked favourably on his letter. By February 1943, Herman was allowed out during the day to work in the forests around Pennsylvania. At nights, he was able to play piano. A month later, Herman was reclassified and released from military prison. Having left prison, Herman formed a new band. They played around the Birmingham area for the next two years. Then in 1945, when his Aunt Ida died, Herman’s left Birmingham. Next stop was Chicago. Moving to Chicago, Herman’s quickly found work. He worked with Wynonie Harris and played on his two 1946 singles, Dig This Boogie and My Baby’s Barrelhouse. After that, Herman worked with Lil Green in some of Chicago’s strip clubs. Then in August 1946, Herman’s started working with Fletcher Henderson. However, Fletcher’s fortunes were fading. Fletcher Henderson’s band was full of mediocre musicians. The main man, Fletcher Henderson, was often missing. He was still recovering after a car accident. So Fletcher needed someone to transform his band’s fortunes. This was where Herman’s came in. His role was arranger and pianist. Herman’s realising the band needed to change direction, decided to infuse Fletcher Henderson’s trademark sound with bebop. However, the band were resistant to change. So in 1948, Herman left Fletcher Henderson’s employ. Next for Herman was forming a trio with saxophonist Coleman Hawkins and violinist Stuff Smith. This trio didn’t last long and didn’t release any recordings. Not long after this, Herman would make his final appearance as a sideman on violinist’s Billy Bang’s Tribute to Stuff Smith. After this, Herman Poole Blount became Sun Ra. Chicago was changing. It was home to a number of African-American political activists. A number of political movements sprung up. They were seeking political and religious change. Herman became involved. He was immersing himself in history. Especially, Egyptology. He was fascinated with the Chicago’s many ancient Egyptian-styled buildings and monuments. This resulted in Herman discovering George G.M. James’ The Stolen Legacy. Discovering this book was a life-changing experience. In The Stolen Legacy, George G.M. James argues that classical Greek philosophy actually has its roots in Ancient Egypt. This resulted in Herman concluding that the history and accomplishments of Africans had been deliberately denied and suppressed by various European cultures. It was as if his eyes had been opened. For Herman, this was just the start of a number of changes in his life. As 1952 dawned, Herman had formed a new band, The Space Trio. It featured saxophonist Pat Patrick and Tommy Hunter. At the time, they were two of the most talented musicians Herman knew. This allowed him to write even more compacted and complex songs. However, by October 1952, he wasn’t writing these songs as Herman Poole Blount. No. Sun Ra was born in October 1952. After Pat Patrick got married, he moved to Florida. This left The Space Trio with a vacancy for a saxophonist. Tenor saxophonist, John Gilmore filled the void. Soon after, Marshall Allen an alto saxophonist joined. So did saxophonist James Spaulding, trombonist Julian Priester and briefly, tenor saxophonist Von Freeman came onboard. Another newcomer was Alton Abraham, who would become Sun Ra’s manager. He made up for Sun Ra’s shortcomings. While he was a hugely talented bandleader, who demanded the highest standards, Sun Ra, like many musicians, was no businessman. With Alton Abraham onboard, Sun Ra could concentrate on music. Alton took care of business. This included setting up El Saturn Records, an independent record label, which would release many of Sun Ra’s records. However, El Saturn Records didn’t released Sun Ra and His Arkestra’s debut album, Jazz By Sun Ra. There are nine tracks on disc one of Marshall Allen Presents Sun Ra and His Arkestra-In The Orbit Of Sun Ra. They’re taken from throughout Sun Ra’s career. The eleven tracks show how Sun Ra’s music evolved from his 1956 debut album Jazz By Sun Ra. What follows is a compelling musical journey. Opening Marshall Allen Presents Sun Ra and His Arkestra-In The Orbit Of Sun Ra is Somewhere In Space. It’s a track from Interstellar Low Ways, which was released in 1966. Given its innovative sound, it’s hard to believe Somewhere In Space was recorded in 1966. It wasn’t. Interstellar Low Ways were originally recorded between 1959 and 1960. Between thirty and forty songs were recorded. The best became Interstellar Low Ways. Somewhere In Space is one of album’s highlights and showcases a musical pioneer as his musical career takes off. The Lady With The Golden Stockings (The Golden Lady) is a track by Sun Ra And His Solar-Myth Arkestra. It featured on the 1960 album The Nubians Of Plutonia which was released on Sun Ra’s Saturn Records. There’s a change in sound on The Nubians Of Plutonia. That’s apparent on The Lady With The Golden Stockings (The Golden Lady). There’s a looser and much more abstract sound. Percussion plays a more important part as Sun Ra fuses elements of free jazz, blues and African music. This results in a coming of age from a musical alchemist. Somebody Else’s World featured on Sun Ra and His Astro Afinity Arkestra’s 1970 album My Brother The Wind Volume II. Originally, it was released on Sun Ra’s Saturn Records. As the new decade dawns, Sun Ra becomes a musical alchemist. Accompanied by the classic lineup of tyne Arkestra, they produce a genre melting track. Elements of Afro-beat, avant garde, experimental, free jazz and soul jazz melt into one. Spontaneous Simplicity is a track from Sun Ra and His Arkestra’s 1971 album, Pictures Of Infinity. It’s has an understated, wistful sound. A flute and percussion combine while the rhythm section and piano provide a subtle heartbeat. Gradually, the arrangement’s secrets and subtleties unfold. Sun Ra And His Solar-Myth Arkestra take you on a mystical, magical and beautiful musical adventure. Angels And Demons At Play was the title-track from The Sun Ra Arkestra’s 1967 album. Released on El Saturn Records, it’s a captivating fusion of percussive delights, free jazz and hard bop. Sometimes, the track borders on avant garde as Sun Ra pushes musical boundaries to their limits, and sometimes, beyond. In 1965, Sun Ra and His Solar Arkestra released Secrets Of The Sun. One of its highlights, was Solar Differentials which closes Marshall Allen Presents Sun Ra and His Arkestra-In The Orbit Of Sun Ra. Sun Ra dawns the role of musical adventurer and combines avant garde, free jazz and his own brand of space age jazz on the piano lead Solar Differentials. It represents Sun Ra at his most innovative and adventurous, as he tries to open the doors of perception. Disc two of Marshall Allen Presents Sun Ra and His Arkestra-In The Orbit Of Sun Ra features a total of eleven tracks. They were chosen by Art Yard, one of Sun Ra’s most trusted and loyal lieutenants in the Arkestra. He’s chosen well on disc two. There’s a mixture of familiar tracks and some hidden gems. 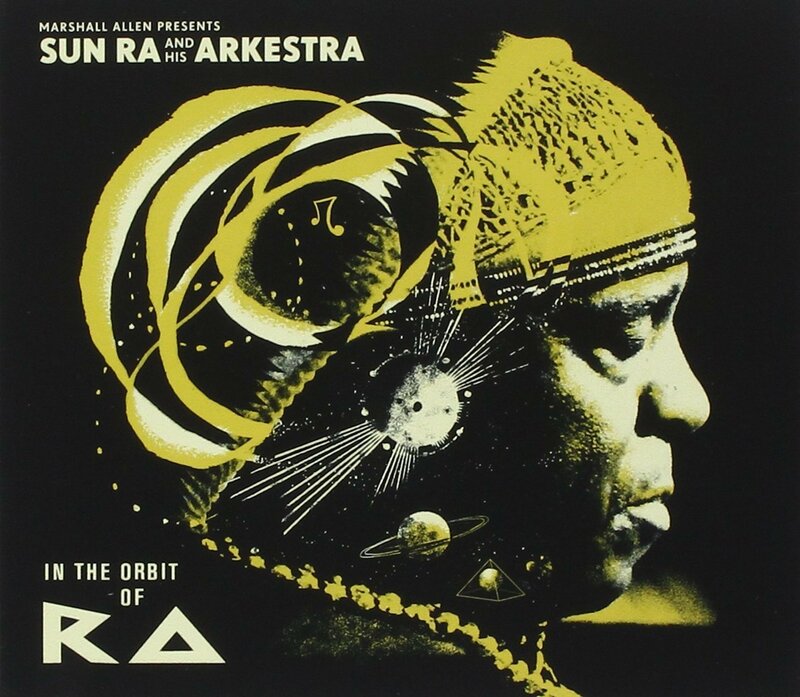 Astro Black was the title-track of Sun Ra’s 1973 album. It was recorded at El Saturn Studio, Chicago, Illinois, May 7, 1972. Released in 1973, it sees Sun Ra experiment with synths and electronic vibes. This gives a hint of what’s to come. The music is left-field and experimental. Free jazz, soul and Sun Ra’s unique brand of space age jazz is combined with elements of classical and soul. The soul comes courtesy of June Tyson, while the Arkestra create a futuristic, experimental and groundbreaking epic track. There’s two live tracks on disc two. The first is Dance Of The Cosmo-Aliens, which was recorded in Milan in 1978. This is a track from his Disco 3000 album, which was released in 1978 ,on El Saturn Records. Just like Trying To Put The Blame On Me, which was recorded in Paris in 1977, this showcases just how talented and inventive Sun Ra and His Arkestra were. They were a well drilled band. Sun Ra was a demanding bandleader, who put his band through lengthy practice sessions. This paid off. Each night, Sun Ra expected and demanded his band to be at the peak of their powers each night. That’s the case on these nights in Milan and Paris. The Nile is a track from Sun Ra and His Myth Science Arkestra’s 1963 album, When Sun Comes Out. It was released on the Saturn Research label. Just like so many of the tracks on Marshall Allen Presents Sun Ra and His Arkestra-In The Orbit Of Sun Ra, it’s hard to believe this track was recorded in 1963. It was way ahead of its time. Indeed timeless is one way to describe The Nile, a pioneering slice of free jazz from a musical visionary. 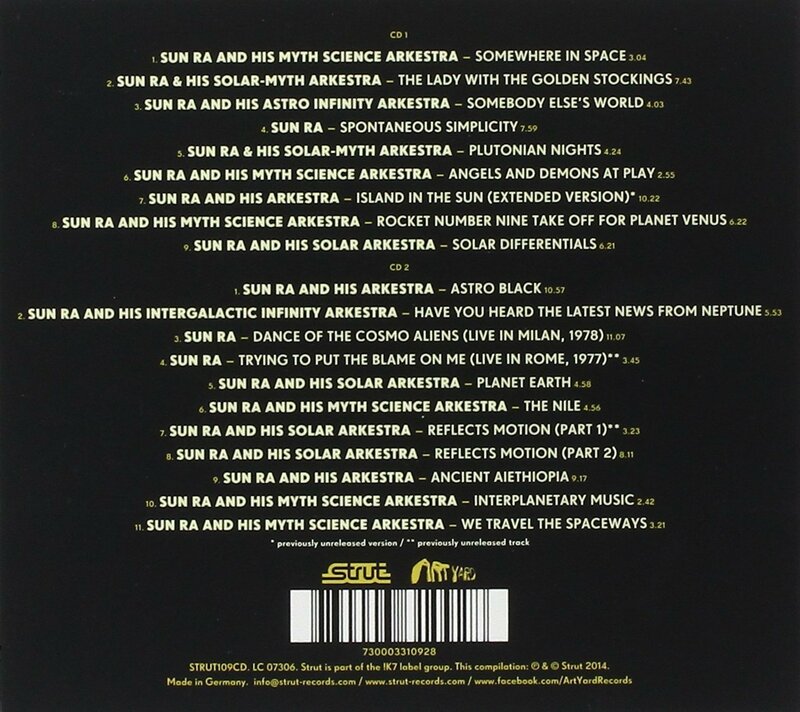 On disc one, Art Yard chose Solar Differentials, a track from Sun Ra and His Solar Arkestra’s 1965 album Secrets Of The Sun. He returns to Secrets Of The Sun for Parts One and Two of Reflects Motion. It features Sun Ra and his all-star band in full flight. Pat Patrick, Marshall Allen, Eddie Gale and Tommy Hunter accompany Sun Ra on this two part, twelve minute epic. It’s an eclectic musical adventure that’s best described as dubby, avant garde, cosmic and experimental. Free jazz and Sun Ra’s futuristic space-age age sound collide head on. My final choice from disc two of Marshall Allen Presents Sun Ra and His Arkestra-In The Orbit Of Sun Ra is We Travel The Spaceways. This is another track from Sun Ra and His Myth Science Arkestra’s 1963 album, When Sun Comes Out. Understated, thoughtful, spacious and wistful, describes We Travel The Spaceways. Essentially, it’s a mixture of the music of the past, present and future. Although it’s not as intense as some of the music Sun Ra made, it’s cerebral, melancholy and beautiful. The twenty tracks on Marshall Allen Presents Sun Ra and His Arkestra-In The Orbit Of Sun Ra are just a tantalising taste of Sun Ra’s music. Over a career lasting forty years, Sun Ra released over 100 years. These albums showcase one of the most enigmatic and innovative musicians of the 20th Century. That’s no exaggeration. While many artists are described as innovative, very few really are. Sun Ra is one of the exceptions. From the moment he dawned the role of Sun Ra, his music was transformed. It became much more complex. This was only possible because Sun Ra found liked minded musicians. Among them were Pat Patrick, Tommy Hunter, John Gilmore, Marshall Allen, James Spaulding, Julian Priester and Art Yard. They became part of Sun Ra’s legendary Arkestra. For nearly forty years, Sun Ra and His Arkestra pushed musical boundaries. Sun Ra was a perfectionist and relentless taskmaster. With some of most talented, inventive and adventurous musicians of their generation, Sun Ra set about honing the Arkestra’s sound. He was demanding and exacting standards. Second best was no use to Sun Ra. What he was after was an Arkestra who were innovators and musical adventurers. Sun Ra was never content to stand still musically. Similarly, he was always striving to reinvent his music. The original version of a song was merely the starting point. What it became, was anyone’s guess? Sun Ra was forever determined to innovate. When he reinvented a track, he took the music in the most unexpected direction. He combined Egyptian history and space-age cosmic philosophy with freeform jazz. This innovative fusion transformed the career of the man born Herman Poole Blount. He became a giant of jazz. However, this didn’t come easily. To create the music on Marshall Allen Presents Sun Ra and His Arkestra-In The Orbit Of Sun Ra didn’t come easy. It took time, patience and dedication. Sun Ra with like minded musicians recorded over 100 albums. This gave Art Yard, one of Sun Ra’s most loyal lieutenants in the Arkestra plenty of music to choose from. Eventually, Art narrowed the music down to the twenty tracks that feature on Marshall Allen Presents Sun Ra and His Arkestra-In The Orbit Of Sun Ra. This double album will be released on Strut Records on 22nd September 2014. It’s the perfect starting point for anyone yet to discover an enigmatic musical innovator. For those familiar with Sun Ra’s music, then Marshall Allen Presents Sun Ra and His Arkestra-In The Orbit Of Sun Ra is a reminder of true a musical visionary as we celebrate the 100th anniversary of his birth. ← BRENT SUPERB 60S SOUL SIDES.